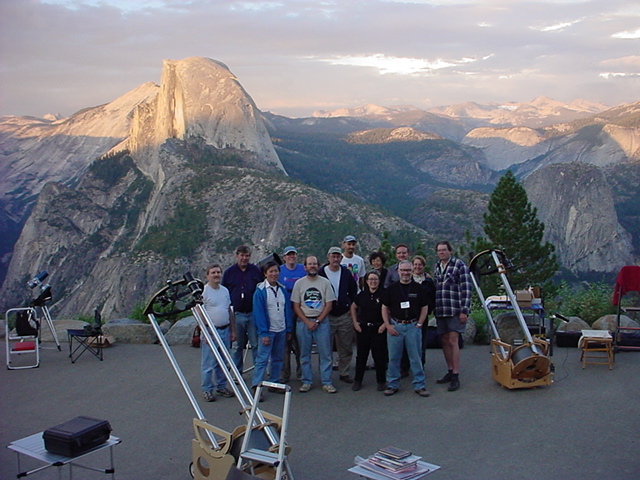 The annual SJAA Yosemite Star Party was held August 5 and 6 at Glacier Point in Yosemite National Park. Photo courtesy of Hsin I. Huang. SJAA's version of Show and Tell is the annual Slide and Equipment Night. Bring your astronomical pictures or inventions on September 17, 2005 to Houge Park at 8 p.m.
You can bring new scopes and point out the fancy features to your envious friends. Last year a few people brought astronomical photos that they had taken. Others brought new scopes optimized for travel. Still others brought new accessories. Of course, it is not mandatory to bring anything at all except your curiosity. Either way, we hope to see you there.